20 Facts About Papaya | Eat This! The papaya is the fruit of the Carica Papaya tree. It is native to southern Mexico and Central America and is now cultivated in many tropical regions. The fruit sometimes used to be referred to as a “tree melon.” In Australia it is called Papaw or Paw Paw. Today there are two varieties of papaya, Hawaiian and Mexican. The Mexican papaya can weigh as much as ten pounds while the Hawaiian usually weighs about a pound. It is the smaller Hawaiian papaya that is found in most produce aisles. The papaya was introduced to Hawaii in the early 1800s. Today, Hawaii is the only U.S. state that grows papayas commercially. In the 1990s, two genetically modified varieties of papaya were introduced to Hawaii, making papaya the first genetically modified food to be introduced into the United States food supply. Unripe, green papaya fruit and the leaves of the papaya tree contain an enzyme called papain. Papain has been used as a natural meat tenderizer for thousands of years and today is an ingredient in many commercial meat tenderizers. Its tenderizing properties are also being applied to the human body. Injections of papain enzyme are given to treat herniated discs. When Harrison Ford suffered a ruptured disc on the set of Indiana Jones and the Temple of Doom, he was treated with papain injections. Papain has other health benefits. it is also a natural digestive aid and can be applied topically in an ointment to treat burns, rashes, and cuts. In many parts of the world, unripe papaya has been used for centuries by women as a natural contraceptive and to induce abortion. 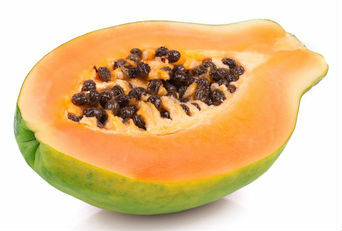 Modern research has confirmed that unripe papaya does indeed work as a natural contraceptive and can induce abortion when eaten in large quantities. In addition, research has found that papaya seeds have contraceptive effects in male monkeys. Tea made from papaya leaves is consumed in some countries as protection against malaria. The Papaya Fruit Fly is a threat to the fruit. The seeds of the fruit resemble peppercorns and are edible. They can be ground up and used as a substitute for black pepper. Papaya leaves are steamed and eaten in parts of Asia. The bark of the papaya tree is often used to make rope. Ripe papaya is usually eaten raw. Unripe papaya can be eaten if cooked and is used in many sauces and dishes around the world. Papaya contains latex (the white sap that oozes out of an unripe papaya) which can cause an allergic reaction in people with a latex allergy. The greener (more unripe) the fruit is, the more latex it contains. As with eating too many carrots, eating too much papaya can cause carotenemia, the yellowing of the soles of the feet and the palms. It is temporary and goes away once excessive amounts of papaya are no longer being eaten. When buying papayas, look for ones that are mostly or completely yellow and give slightly to pressure. Green, hard papayas are unripe and will never ripen properly. A small papaya contains about 300% of the recommended daily amount of Vitamin C.